There hasn’t been much innovation in the design of the protective mouth guard since it was invented around the turn of the 20th century. Force Impact Technologies is looking to change that. 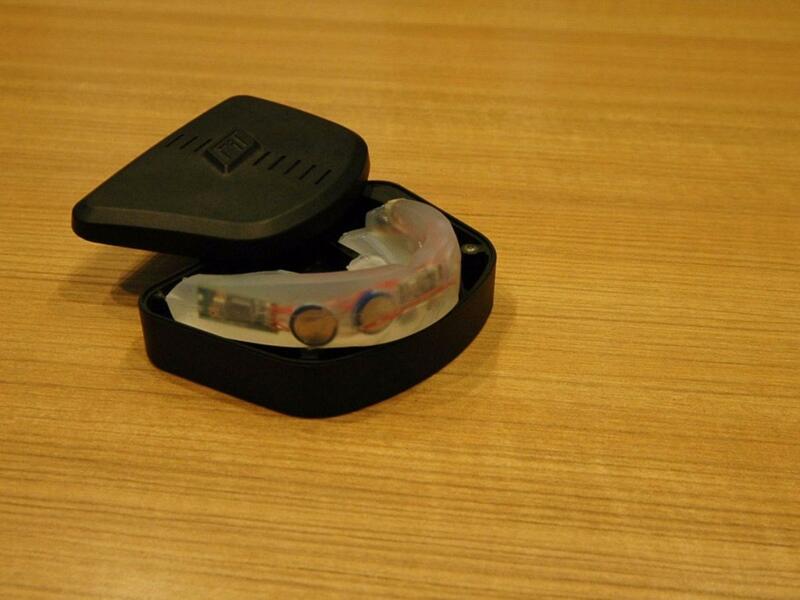 The startup built a prototype called the FitGuard, a “smart” mouth guard that detects when a player receives a hard hit. If a football player gets knocked with a 21-g impact to the head, for instance, the mouth guard will light up red after the play, also sending the data to a smartphone app via Bluetooth. The product is a potential game-changer in sports where concussions have become a serious problem, like football, ice hockey, and soccer. And with major films being made about the sports injury, the issue continues to be discussed, though Force Impact cautions it’s just a first step in helping identify concussions. When players receive their FitGuard, they pair it up with the smartphone app and input their age, gender, and weight. The actual mouthguard itself looks and feels like a normal one — it can even be dropped into boiling water — except this one has an accelerometer, gyroscope, magnetometer, and LED light on the front for notifications. If an athlete takes a blow, it lights up on the front with different colors to signify the hit level. Green means it was a low impact, blue is moderate, and red is a high impact. In the case of a red impact, coaches might want to take that player out for a concussion screening (the app also includes a CDC questionnaire for non-medical professionals). Beyond evaluating a single impact, the FitGuard’s data can be tracked by parents and coaches over the long-term. If an athlete takes a blow, it lights up on the front with different colors to signify the hit level. Green means it was a low impact, blue is moderate, and red is a high impact. In the case of a red impact, coaches might want to take that player out for a concussion screening (the app also includes a CDC questionnaire for non-medical professionals). Beyond evaluating a single impact, the FitGuard’s data can be tracked by parents and coaches over the long-term. Brain injuries have a life changing impact on the lives of the victims and their families. Our team at Graves and Richard Professional Corporation, Personal Injury Lawyers is knowledgeable and experienced in dealing with closed and open head injuries. When you or a loved one has sustained a brain injury, you need to focus on healing. Let our experienced team at Graves and Richard Professional Corporation, Personal Injury Lawyers look after the rest.